Cauliflower is a seriously underappreciated vegetable. When it comes to fresh produce, we talk about eating the rainbow. Red, green, yellow, orange, blue … but who ever thinks about white? And yet, 1 cup of chopped cauliflower contains 85% of your daily vitamin C needs with only 27 calories. Who knew? As a member of the cruciferous vegetable family, cauliflower has also been linked to many health benefits, including cancer prevention and improved cardiovascular health. 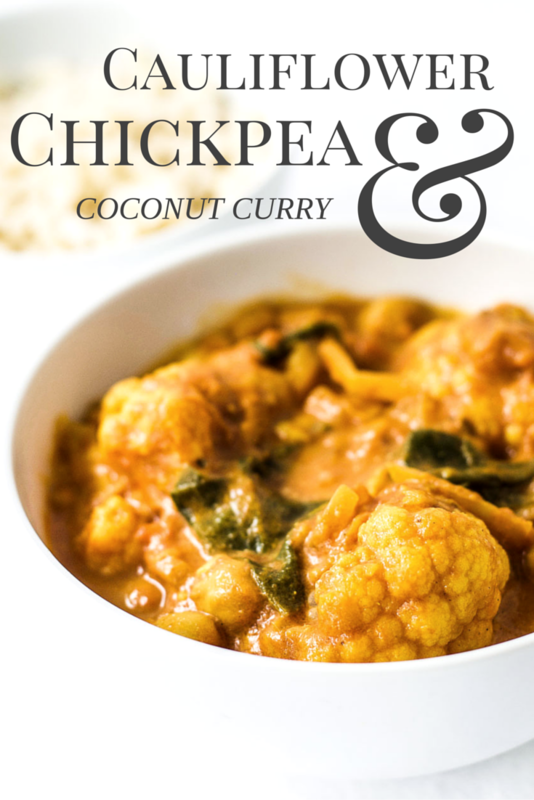 So to give the humble cauliflower a little more love, I decided to put together this coconut cauliflower chickpea curry. We love to eat curry in our house. It is such a wonderfully healthy form of comfort food. It also lends itself well to being vegetarian or vegan. While we do eat meat, we try to keep it to a minimum. I guess you could call us reducetarians (yes that is a real word for people who are trying to eat less meat). 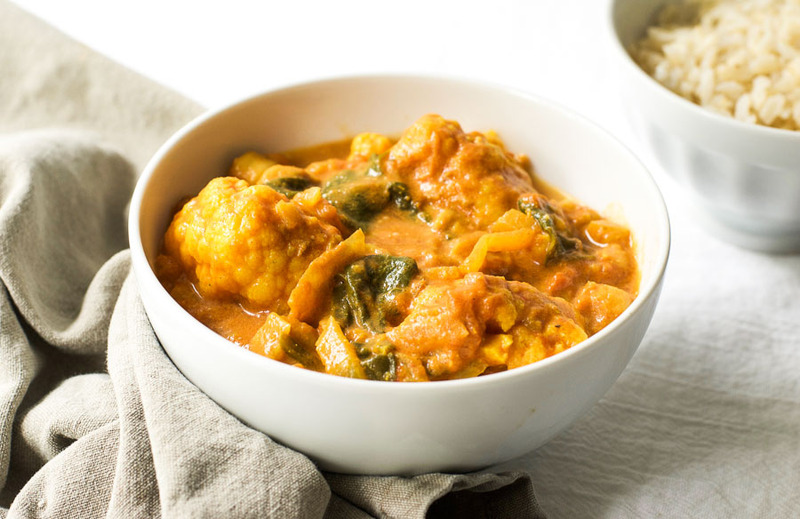 Vegetables have such an excellent way of soaking up all the delicious curry flavors. And there are plenty of plant-based ways to add protein – lentils, beans, or in this case, chickpeas (garbanzo beans). 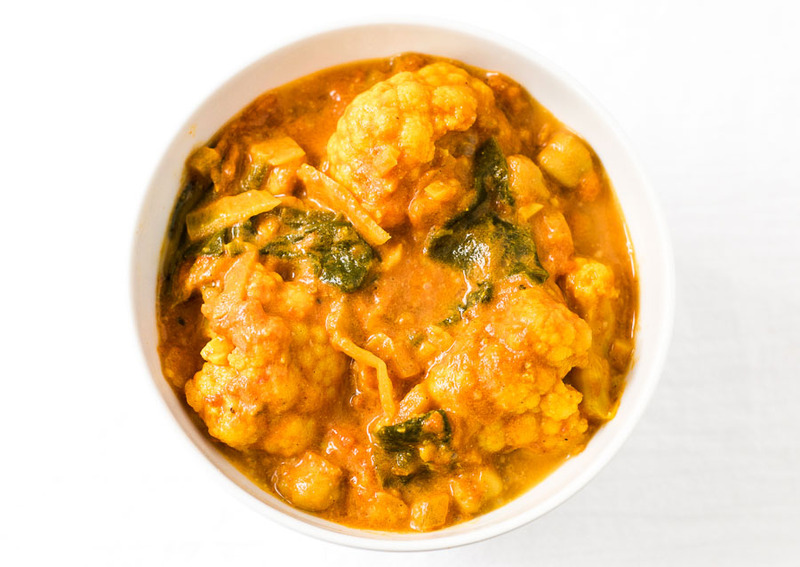 The great thing about this coconut cauliflower chickpea curry (besides the fact that it is healthy AND tasty) is that it is extremely easy to make. You just fry the onions, garlic, and ginger, add the spices and toast them for a minute, throw in the rest of the ingredients and simmer for 20 minutes, then add some coconut milk and spinach just before serving. Boom. Done. Delicious dinner ready. And if you hold back on the red pepper flakes a little, it is also suitable for children. 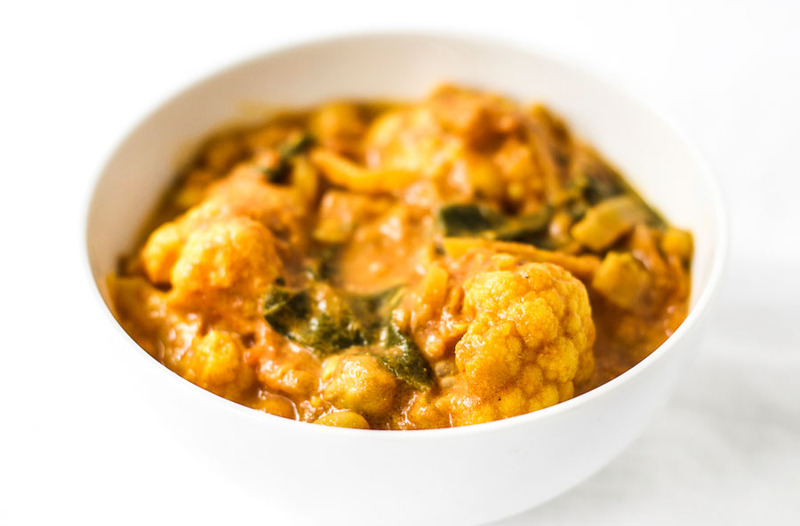 This coconut cauliflower chickpea curry contains lots of fresh ginger, garlic, and turmeric, making it a wonderfully healthy comfort food. Heat coconut oil in a large pan over a medium-low heat. Add the onion and cook for 3 minutes. Then add the garlic and ginger and cook for a further minute. Add the cumin seeds, turmeric, ground cumin, coriander, and garam masala, and cook for 1 minute, stirring constantly. Add the cauliflower, tomatoes, chickpeas, water, chili flakes, and salt. Break up the tomatoes using the back of a wooden spoon. Cover and simmer for 20-25 minutes, or until the cauliflower is tender. This curry looks so hearty and delicious. I love coconut curries, they are always so creamy and flavoursome. Yum! What a beautiful curry! Love both chickpeas and cauliflowers and will have to make this. Thank you Jasmine. I hope you like it. Ok so I am in the process of making this dish (my house smells so good right now!!!) I used Garam Masala but I am noticing it says may replace curry powder… I know this is a curry dish but there is no curry on the list… are my eyes playing tricks again? Anyone use curry powder? It may be too late now, but I wanted to explain in case you make it again. What I meant was that you could use curry powder instead of garam masala if you don’t have any garam masala. Sorry for the confusion! 5 star cauliflower *******fabulous and yummy! Mine was a bit watery – in my haste, I added the coconut milk before the 25-30 minute simmer. I’m on a 30 day no grain/dairy elimination diet and wondered what I could used to thicken this up. Any suggestions as I can’t use cornstarch or what flour. Thank you for your very kind comment 🙂 You could try using a little tapioca flour, or some coconut flour. Just ate this! One of the best foods I’ve made in a while! Only thing I changed was I used about half a tub (from Costco) of cherry tomatoes, cut in half, rather than canned. Served on a bed of baked butternut squash and brown basmati rice. Oh my tummy is very happy! What a lovely comment. Thank you. I’m so glad you enjoyed it. And I love the idea of using fresh tomatoes rather than canned. Yum! Delicious. I made it with only one fresh tomato, no spinach and peppers, added some chicken breast, and used a full can of reduced fat coconut milk. Served it as a soup with a side dish of white rice. I didn’t care for this. Even after doubling the spices and salt, it didn’t seem to have much flavor. No one at the potluck ate it either and I made a double batch, so I’ll be eating it for a while. I think I’m going to try adding something to give it some tang (lemon?) and more coconut milk. Wish me luck! I think I figured out what I did wrong: I used fresh tomatoes, and I may not have put enough in. I’m going to go buy another 28oz can and see what that does. Hi, I’m doing a nutrition plan for a client and I wanna use your delicious recipe. I was just wondering does the nutrition information include the rice and if yes, how much?Thank you! I found this a lot more bland than I expected and I had doubled all of the spices. Not sure what’s missing except maybe more spice. Smelled great and I like the flavors if they’re just very bland. I made this for dinner tonight and it was so delicious! 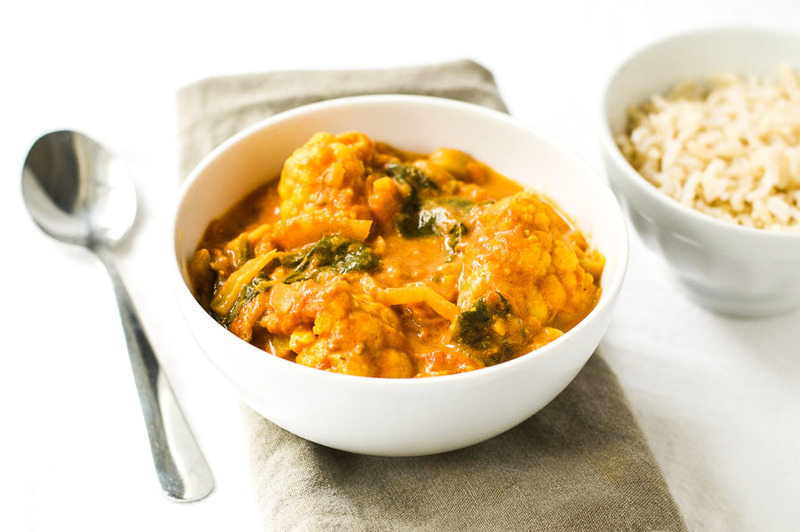 If you’re craving a warm vegan curry, definitely give this a shot! Super easy, tasty, and affordable. I cooked it without spinach because my boyfriend isn’t allowed to eat spinach with his kidney stone disease, but it was still top notch! This is so easy to make and absolutely delicious! My husbands new favourite dinner! I also made it for some friends one of whom was a chef and they all raved about it! I just made this – it’s sooooo yummy! I don’t like my curries too tomato-y so I cut that in half and added a little more water and was still good. I didn’t have fresh ginger or spinach but a bit of ginger powder and frozen spinach we’re still delish. Thank you so much! Made this curry a couple of weeks back but didn’t have some of the spices and ran around to get them. I was all over the place when I made it so I didn’t get the spices right but it was still lovely. I have made it again today and have doubled the spices used two onions and a whole cauliflower. Added beans, chopped coriander and extra coconut milk. Fingers crossed, it looks great so I’m so looking forward it! We tried this recipe last night and it was simple and delicious! So good that even the kids loved it! Thanks for sharing. I made this last night and it was absolutely delicious! Thank you for the recipe! Made this last night, the sauce was delicious! I used curry powder instead and didn’t have any spinach so added a red pepper. Severed with brown rice. I was really happy with it considering I had no idea what we were having for dinner and it was even toddler approved! Thanks for sharing, this will definitely be something I make often. I made this tonight, and oh boy was it delicious! I did tweak it a little though. I substituted vegetable stock for the water, probably tripled the spices after reading the other reviews, and also added some smoked paprika which brought out some amazing depth to the flavour. Thanks for sharing this recipe! I already can’t wait to make it again! Awesome recipe! My friends and I loved it. Can’t wait to make it again. What an awesome curry recipe! I love it and so does the hubby and kids. Thanks for sharing.